Punalu’u Black Sand Beach is one of the finest examples of a true black sands beach anywhere in the world. The obsidian-black sand at Punalu'u is truly a sight to behold. Unlike many beaches composed of gray sand that may appear black, particularly when wet, there is no mistaking the thick black volcanic glass at Punalu’u. Beaches of genuine black sand are rare. The term "black sand" is used to describe Hawaii beaches whose sand has a high concentration of black volcanic glass. They are created when molten lava from an a’a flow enters the ocean, quickly solidifies and shatters into tiny glass fragments. The lava then continues to be broken down by the pounding waves into smaller fragments of sand. The beach is created as waves and currents push the glassy sand back on shore. 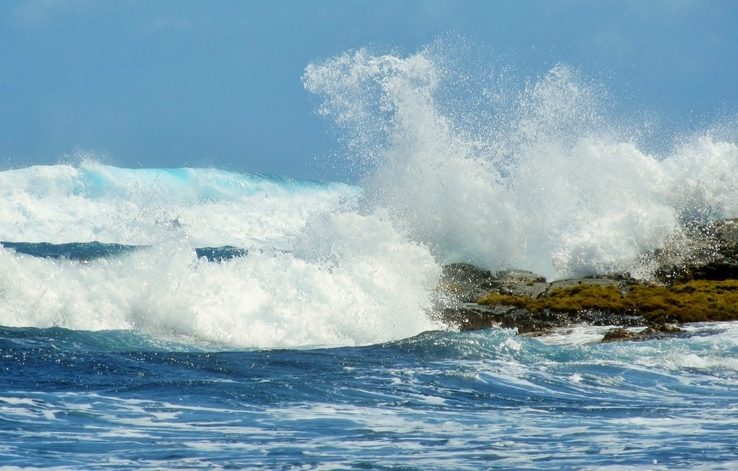 Among Big Island beaches, Punalu'u provides the most dramatic evidence of this process. In all Hawaii, genuine black sands beaches are only found on the Big Island. 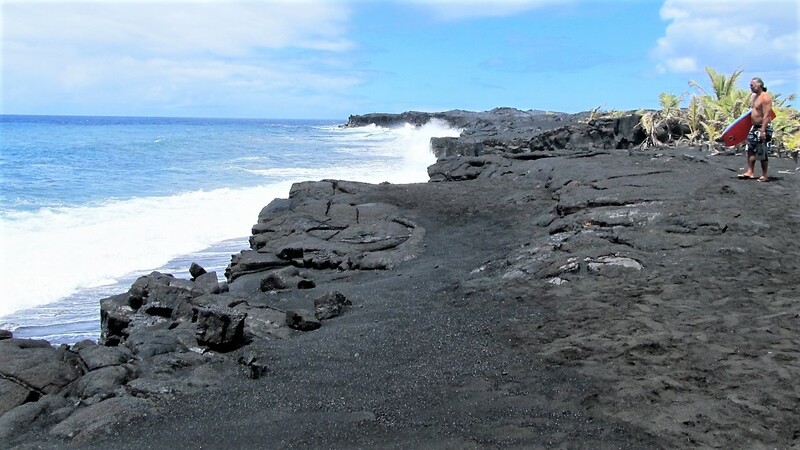 While many Hawaii beaches may be called a black sands beach, most of them are a composition of different types of gray sand, with perhaps only a very small percentage of volcanic glass. Even the beach at the mouth of Waipi'o Valley, which looks sort of grey-black, has only about a 1% concentration of volcanic glass. Several small pockets of true black sand can be found near certain shoreline areas as well. 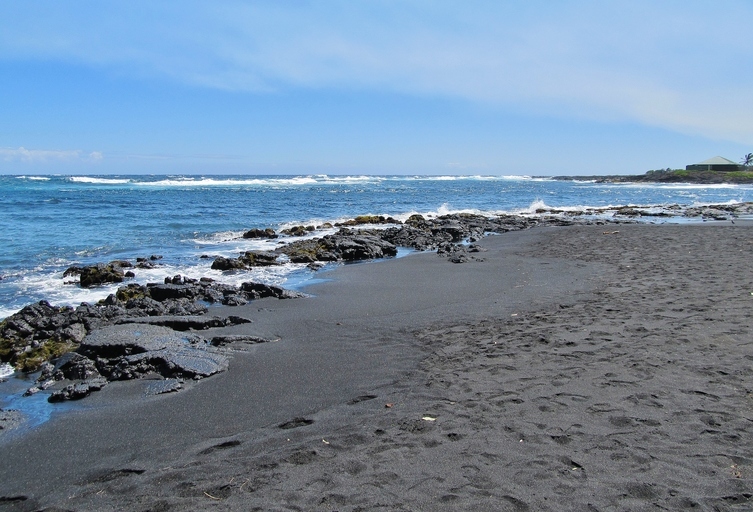 Kaimu black sand beach in the south Puna district was another famous example of how a beach is formed by volcanic glass. This once pristine beach was buried by a Kilauea eruption in 1990. Kaimu was once a pristine black sand beach. There is a pretty, palm fronted freshwater pond behind the beach. The structures behind the pond are the remains of the Ka'u Center for Hawaii History and Culture, built in 1973, destroyed in 1975 by the tsunami that was triggered by the 7.2 magnitude Ka'u earthquake. More than four decades later, it's as if everyone ran for their lives and never returned. 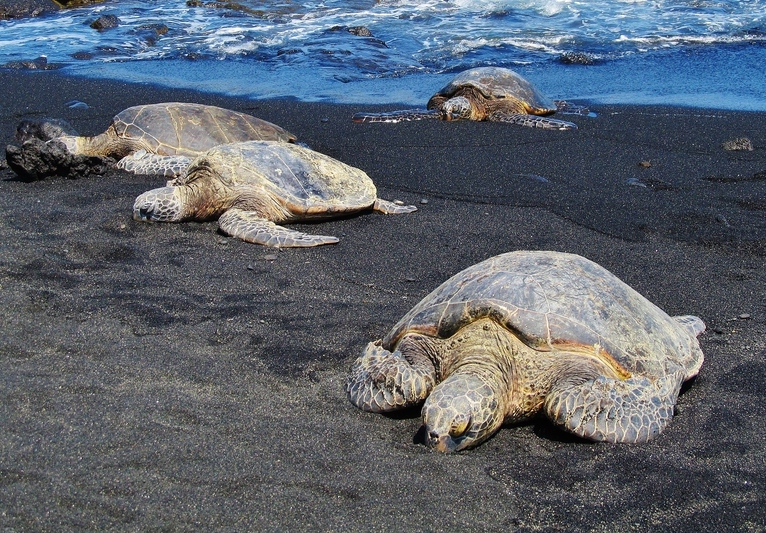 Punalu'u is one of the best Hawaii beaches for spotting Honu (Green Sea Turtles). If you don't see turtles resting in the sand, they are generally not far off shore, grazing in the shallows or floating in the surf. Please don't disturb the turtles and stay at least 15 feet (4.5 meters) away. You may have company when swimming as the water is sometimes crowded with Honu. The setting at Punalu'u is beautiful and peaceful. The beach is rarely crowded, and is a wonderful place to relax. There is usually plenty of room to spread out right on the shimmering black sands beach or under the shade of a coconut palm behind the beach. You will enjoy stunning vistas of the open ocean, and waves crashing on the rocks to the south. The ocean can be pretty rough here, and rip currents are common, especially toward the northern (left) end of the beach. Use extreme caution when swimming, and stay close to the shore. 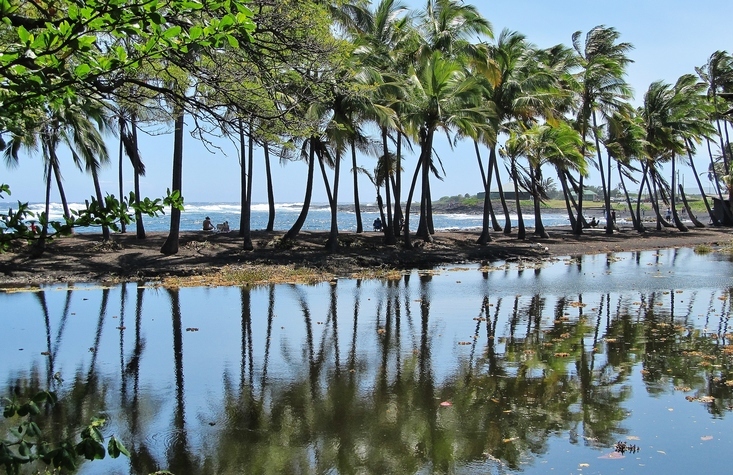 Located between the towns of Naalehu and Pahala along the southeastern coast of the Ka'u district, Punalu'u is just off Highway 11, 55 miles from Hilo and 65 miles from Kailua-Kona between the 55 and 56 mile markers. There are picnic tables, restrooms, and a small snack bar on the beach. Do you like black sand beaches? Share this page on Facebook or Google Plus! 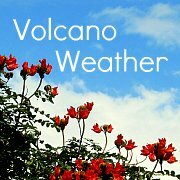 What's your favorite Big Island beach? We're always curious what our readers have to say. Share your own story, maybe even a photo or two. We'll publish it right here for other readers to enjoy.